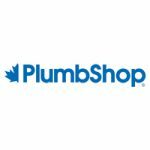 PlumbShop® is Canada’s number one provider of do-it-yourself plumbing products. The extensive PlumbShop product line features 18 different categories, including repair products for faucets, sinks, tubs and showers, toilets, water supply kits, brass fittings, and tubular drainage components. Do-it-yourselfers and professionals alike can also select from items including an array of Water Wise™ water-saving products that complete the company’s broad product line. PlumbShop is supported by a robust Canadian team that includes product development, engineering, sales and marketing.